NGINX is an open source web server with a strong focus on high concurrency, performance and low memory usage. It’s one of the most popular web servers on the internet, and can also act as a reverse proxy, a load balancer, or as an HTTP cache. The Librato Agent allows you to easily monitor the health of your NGINX service(s). We use collectd’s nginx plugin to gather metrics from the running NGINX server. It requires that your nginx binary is compiled with the stub_status module enabled. Note: This plugin only supports the gathering of metrics from the open source NGINX web server. It does not support the commercial NGINX Plus server. We may offer support for that service at some point in the future. The NGINX integration depends on the Librato Agent. If you haven’t already, you will first need to install the Librato Agent. 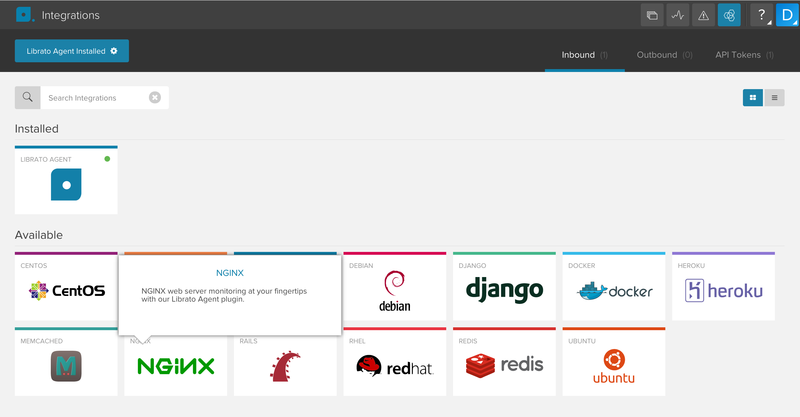 Once this is complete, select the NGINX icon in the integrations catalogue. Toggle the Enabled switch to activate the NGINX integration on your Librato account and create the preconfigured NGINX Space. At this point your integration is complete and any NGINX metrics associated with this integration will be allowed through your Librato Agent service-side filters. Your NGINX server will need a location defined with the stub_status module activated. Here is a sample definition that allows connections from the local agent and works with our default plugin configuration. Alternatively, you can adjust the URL setting in the /opt/collectd/etc/collectd.conf.d/nginx.conf configuration file to match your particular setup. Note: You must restart the agent after any changes to your Librato Agent configuration files. At this point you should begin seeing librato.nginx. * metrics in your Librato account. Visit your preconfigured Space to observe your new metrics as they stream in. You can use our dynamic source field at the top to filter your view to a subset of metric sources. For example, you may want to isolate the view to a specific tier of web servers or even to an individual machine that is behaving badly. The NGINX integration supports the following metrics and tags. Note: All metrics are prefixed with librato.nginx..